Automata is an inventive movable kiosk for Chicago Park District’s kiosk program as part of the 2015 Chicago Architectural Biennial. With an entire lakefront as a possible site, Automata was designed with precise orientation to the cardinal directions, framing and activating the opposing forces it mediates - one urban and the other natural. The kiosk creates a structure that is responsive to its context and activates the ephemera and temporality of landscape. Automata will act on its own free will in direct response to the presence of wind, people, and wave action on Lake Michigan. Wind is the primary driver for the orientation and responsive nature of the kiosk. 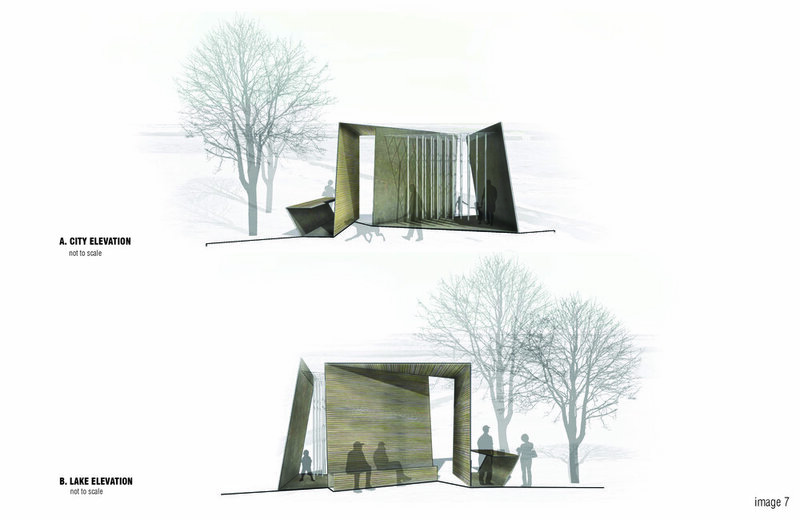 The main structure of the kiosk is made of welded recycled steel plate. The plate is sourced from Marine Recycling (MR) in Ontario where they source .625” steel from decommissioned single wall oil tankers. Automata is designed as an interactive set of experiences. The central wall, perpendicular to the prevailing winds, accommodates a long bench and divides the structure into two rooms: the lake room and the city room. Both rooms respond to and are activated by a varying set of phenomena, each amplifying its adjacent conditions. The lake room, clad in reclaimed teak from a decommissioned cruise ship (also sourced from MR) forms both a threshold and frame to the lake, allowing for contemplation and the re-presentation of the water. The lake room measures two elements: the wind surrounding the kiosk and wave action in the Chicago harbor. The wind intensity is measured by an anemometer, triggering LED strips set behind the wood cladding to glow brighter with stronger winds. Meanwhile, Chicago Harbor’s wave action is measured by sound transmitted from a whistle buoy set off shore that will groan through speakers hidden below the bench.seating, a video screen and electric outlet are deployed from inside allowing for basic event infrastructure. The mechanical crank and pulley systems inside the structure allow these functions to be fully deployed for events in less than 10 minutes. 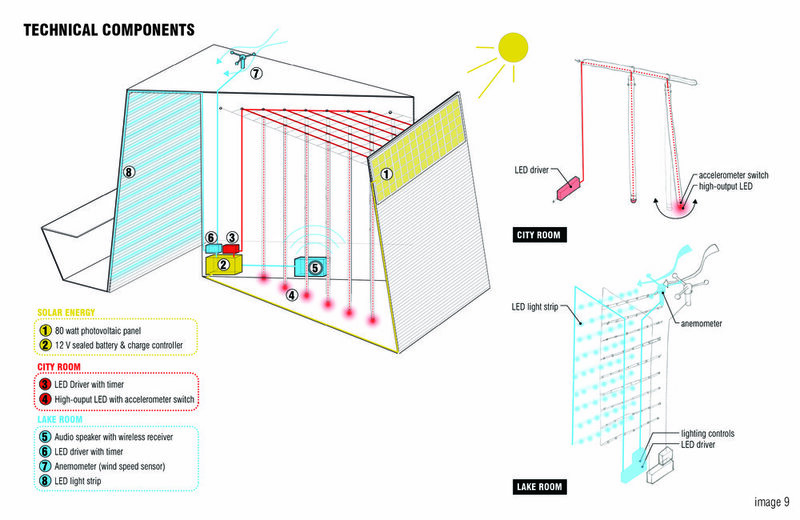 The city room, open to the sky, houses a human-activated chime within its bare steel walls. The chime installation is made of salvaged 2” diameter steel tube with magnets and LED’s in the bottom, suspended by a steel cable grid. The twenty-six 10’ long metal tubes clang together as people pass through the space toward the lake. LED lights trace the movement of the tubes on the ground plane and bottom mounted magnets will continuously pull the tubes back into place. The steel walls of the lake room also act as a megaphone, carrying the sound back to the city.